Following the overwhelming and worldwide popularity of the TV show Game of Thrones, it was only a matter of time before one of the RLD team went to do the tour in Belfast. Affiliate and Partnerships Manager Gemma was lucky enough to experience it earlier this year. Find out how she got on! 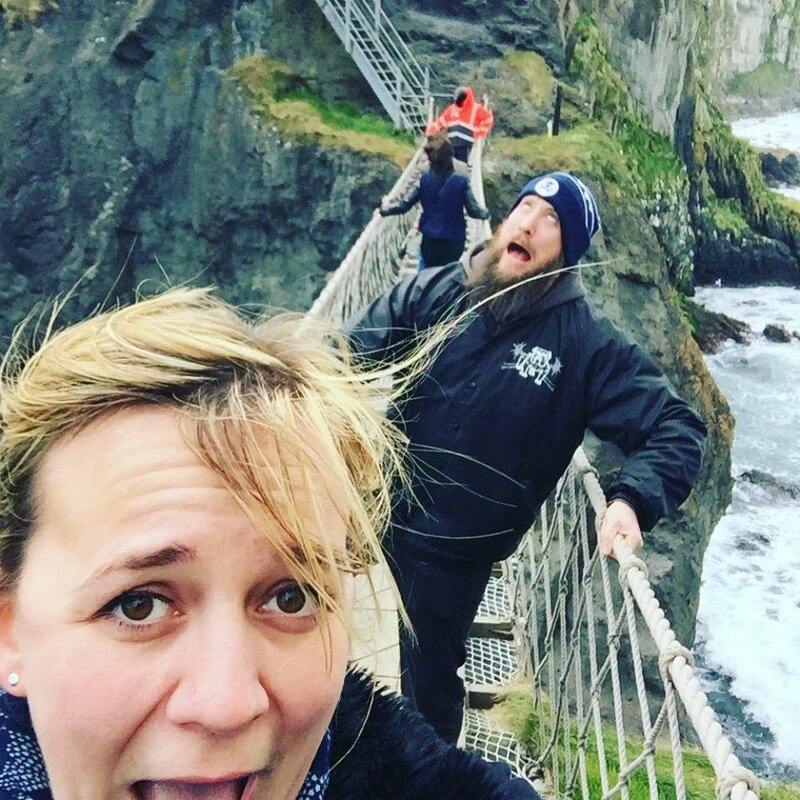 Gemma and her partner Ross set off from Belfast around 9am to do the Games of Thrones tour with a local guide to the area who is a fan both of the George Martin books and the TV series. They followed the picturesque coastal road out of the city (the lengthiest part of the trip) but the tour guide kept them entertained on board the coach pointing out local landmarks, areas of natural beauty and interest, and before they knew it, they had arrived at the first stop of the tour. They had come to a little town called Glencloy, where the tour guide showed Gemma, Ross and the rest of the tour group the new filming location from season six. If you haven’t already recognised (or haven’t seen it yet in the programme then look out!) it, this spot is where Arya Stark climbed out of the water via the stone steps. Next on the Game of Thrones tour was Cushenden Caves. Here Gemma and Ross could actually walk into the caves where Melisandre of Asshai had given birth to her shadow assassin. After this location it was time for a pub lunch, which had to be pre-ordered on the coach and paid for in addition to the tour. The food received mixed reviews from our pair. Ross enjoyed his but Gemma suffered from a lack of choice for vegetarians. If you think lunch might be an issue, bear in mind you can plan in advance as you’re welcome to take your own food. After capturing a photo at the Camp of Renly Baratheon of Storms End, they hopped back on the coach for a 2 minute drive to the next location – Lordsport, where Theon Greyjoy had returned to his birth family and betrayed those who raised him. The coach sped next to the Giants Causeway – please note that this trip involves a lot of getting on and off the coach but it’s worth it! The Giants Causeway is not a filming location but the UNESCO listed list is such a famous area of natural beauty and a beautiful place to explore. Gemma said that “Had it not been included on the tour I would have been very upset because it was absolutely stunning”. TOP TIP – visitors often assume the Giants Causeway can only be accessed via the visitor centre which charges an entry fee, but this isn’t the case. The last photo stop, the place whereby Arya Stark dressed as a boy to escape the Kings Landing, was the Dark Hedges – photographically stunning intertwined trees that take the breath away. Gemma concluded “Even if you are not a Game of Thrones fan, this tour has plenty to keep you entertained. The scenery alone is enough as it is just so stunning and such a beautiful location. I would recommend it to everyone”. If you fancy following in Gemma’s footsteps and discovering the tales of legend and local history, go on our Game of Thrones experience! Images: Gemma on behalf of RLD.